Merrill Guerra was very frustrated by the lack of stylish clothes available for her daughter. After learning that many parents shared the same frustration, she was inspired to take action in a very ambitious manner. While a student in the U-M MBA program, Merrill started a company that sells comfortable and fashionable clothing for plus-size girls. Thanks to investment from friends and family, and several business-plan prizes, RealKidz Clothing was well on its way. RealKidz Clothing website. Branding and design by Pryor Design Co. I met Merrill through the graphic design studio she retained to design her new company’s visual branding and website, Pryor Design Co. 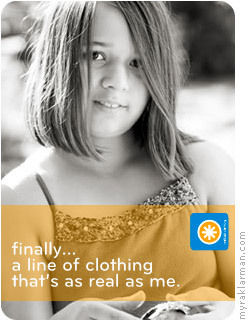 Early in the design process, Scott Pryor and his team noticed there wasn’t very good stock photography of plus-size kids. Undeterred, Merrill resolved to have a collection of images created from scratch, and Scott referred her to me. I photographed Merrill’s daughter and some of her friends at Island Park. It boggles my mind that I was creating something that she couldn’t get anywhere else: photography showing plus-size children at play. The images I captured have been used to help sell the concept of RealKidz Clothing to investors, and to raise money to put the first line of clothing into production. 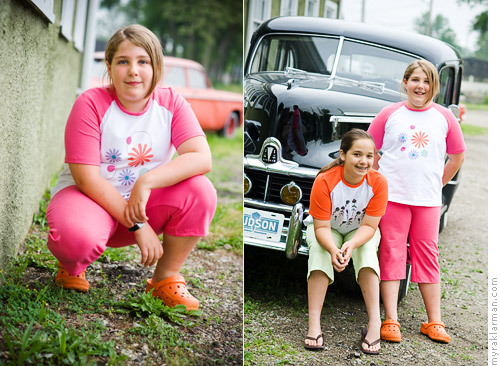 Last week I was delighted to photograph the girls again, this time wearing the newly released RealKidz Spring/Summer 2008 Collection. Merrill and I thought it would be appropriate to conduct the shoot in historic Depot Town, where the RealKidz Clothing storefront is located. What a colorful area to play in! Ever wonder about what it’s like to start a clothing company from scratch? Merrill shares the highs and low of the roller-coaster ride on her blog. Pass the word about RealKidz along to your friends. Let's help this local upstart grow stronger. Because girls of every size deserve to look and feel good.